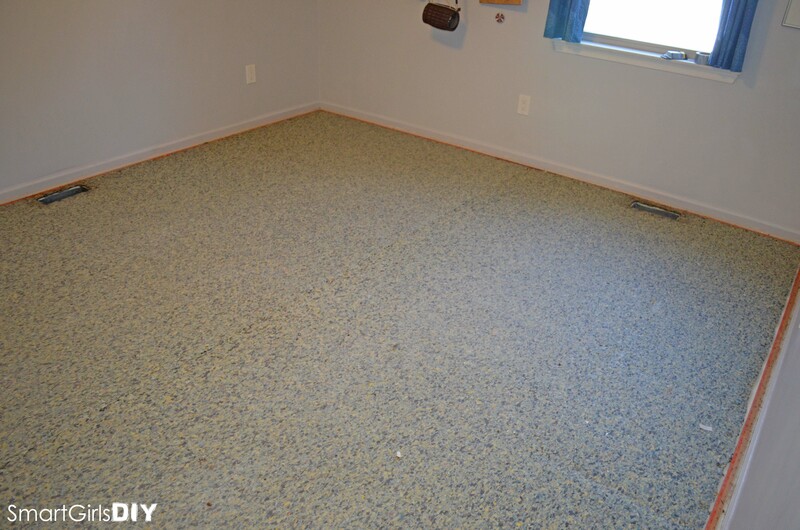 So far I have successfully installed carpet in my son’s bedroom (posts here and here) and now I’m ready to do Smart Jr’s bedroom. Her carpet was disgusting!! I mean really gross. I’ve steam cleaned it a bunch of times, but it doesn’t do any good. The stains will disappear, but then they come back. What’s up with that? Where do they hide? I really don’t get it. Sorry — most of the pictures stink! 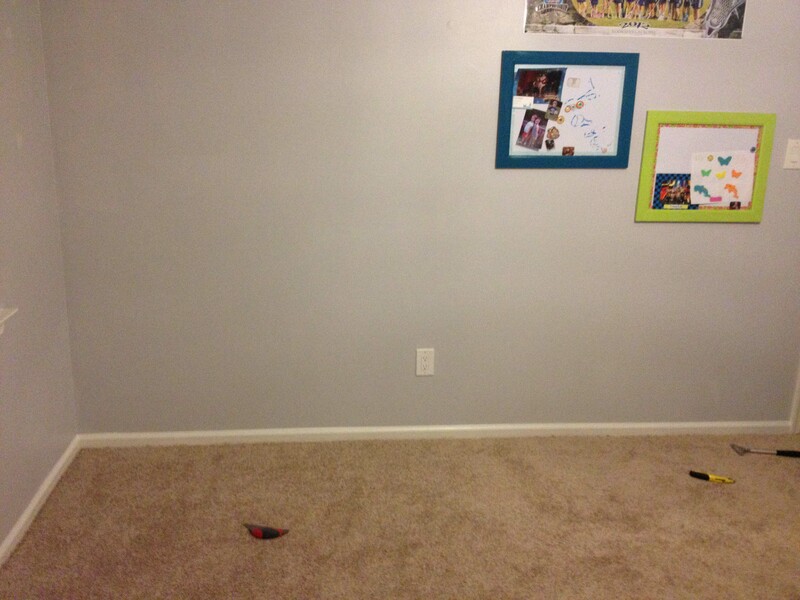 I’ve said it before, but I’ll say it again… the hardest part of installing new carpet is emptying the room. Well, that and cutting the carpet, but this time I cut it all in the room and it wasn’t so bad. There’s no way to get around this. Unfortunately. Get all the furniture and everything else out of the room. All the junk ended up in the master bedroom. Sigh. Remove any doors, either by removing pins from hinges or by taking doors off their sliding track. Also remove any door stops. Finally, remove all floor vent covers, which should just lift right off. I told you the carpet was gross! Start by pulling up a corner, either by hand or with a small crowbar. If that doesn’t work, try pulling up around one of the floor vents, where you’ll be able to get a good hand hold on the carpet. 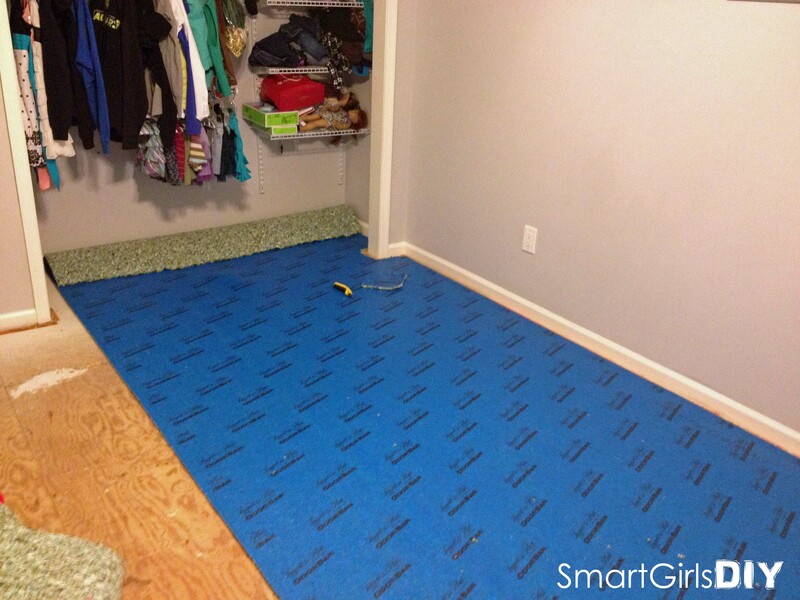 The easiest way to get the carpet out of the room is to cut it into 3 foot strips. Trust me, this bums me out because I HATE extra steps, but it wasn’t too bad. 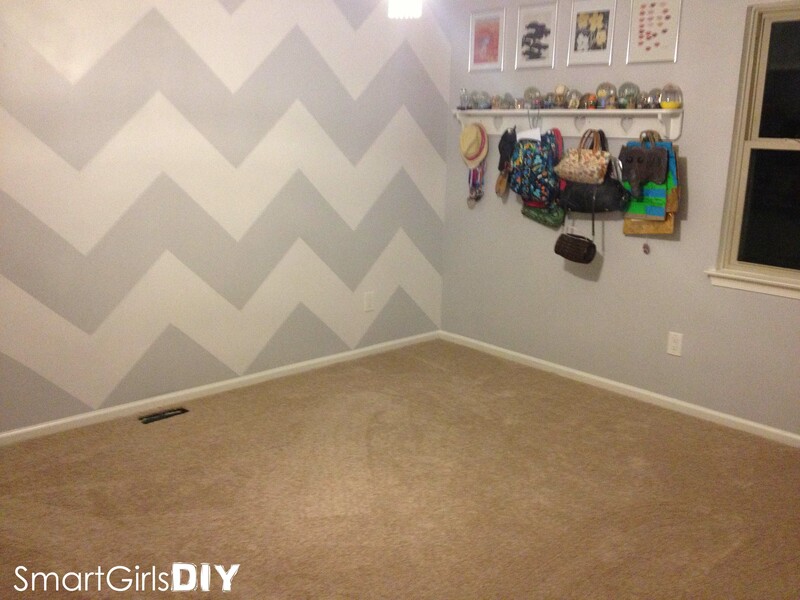 Starting along a wall, free the carpet from the tack strip and pull it toward the center of the room, folding it away from the wall. Now that it’s turned over, and you’re looking at the mesh backing, you can cut the carpet with a SHARP razor blade. 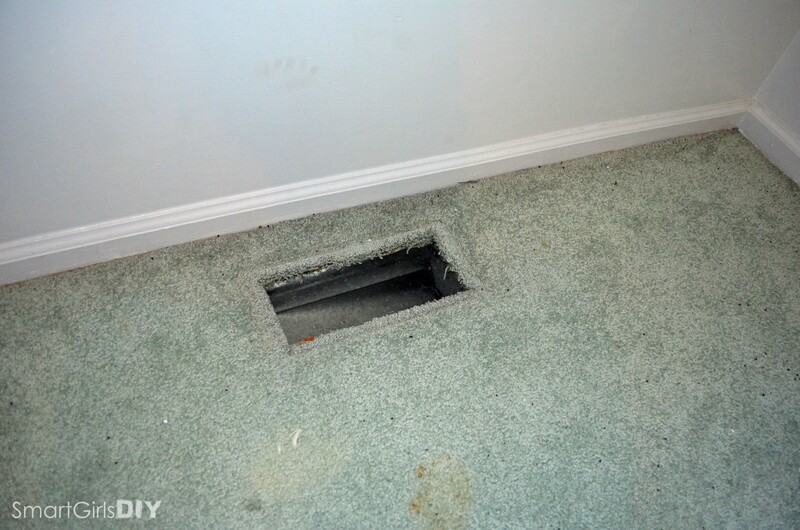 Push the blade all the way through the carpet and it will tear quickly and easily. You have now removed your first 3 ft section of carpet. Go ahead and roll it up (either carpet side in or out, doesn’t matter) and stick a piece of duct tape on it so it doesn’t unravel. I made a pile of carpet rolls in the hallway and then had hubby bring them out to the trash. I’m a smart girl, remember. 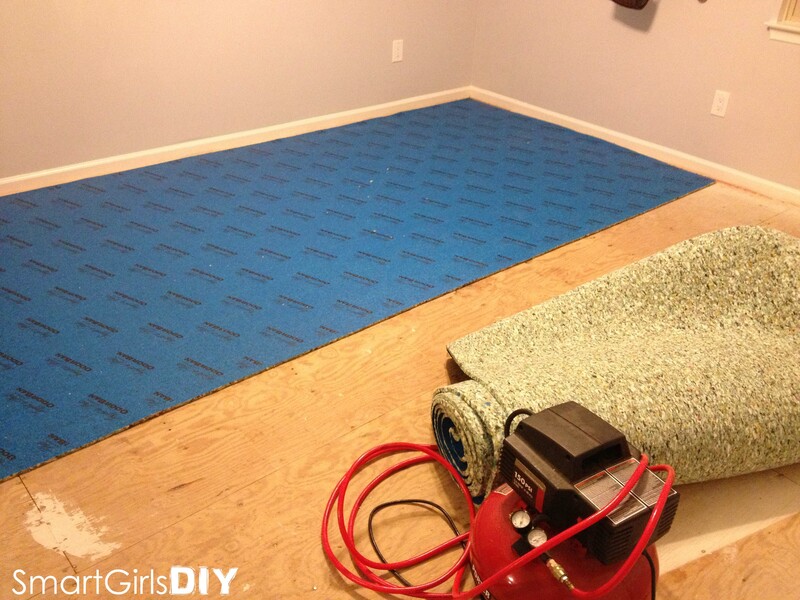 Taking out the carpet pad is much easier than taking out the carpet. No cutting necessary. 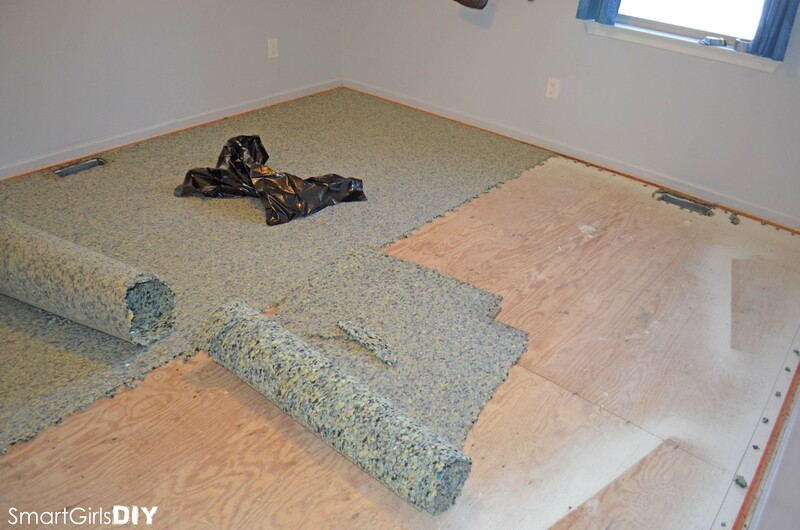 Depending on the carpet pad (brand, style, age, how it was stapled down) it might come up in large pieces, which can be rolled up the same way as the carpet. Or it will crumble into a bunch of small pieces and you’ll need to have a large trash bag handy. A floor scraper (if pushed with enough force) will cut the staples or push them out, theoretically clearing a strip of staples at once. It never worked too well for me though. Granted, I bought a cheap $9 model, while I see that they sell $300 models. Maybe I’ll go crazy and try a $25 model one of these days and see if I have better luck. For stubborn staples, use a small claw bar / cats claw/ nail puller and peel them out of the sub floor. When all else fails I use the big old pliers and yank those suckers out. 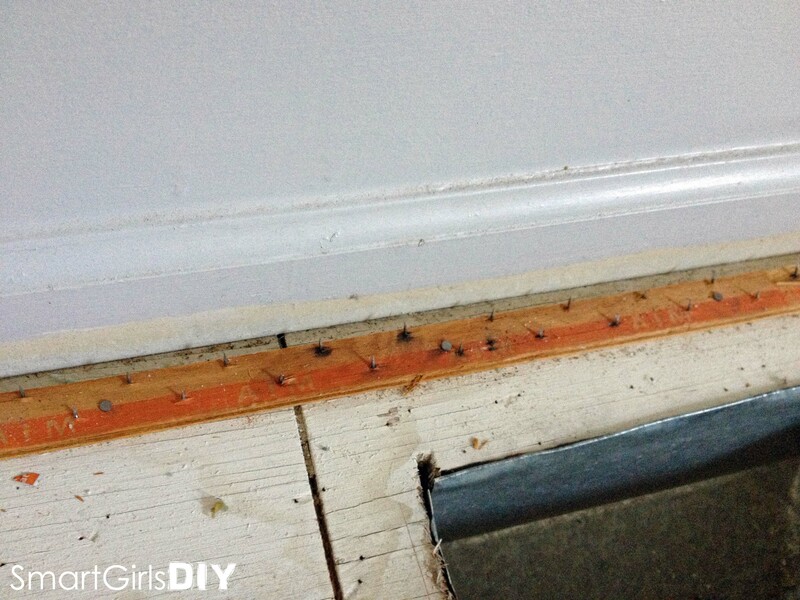 It’s fairly common for the tack strips under windows, or near floor vents, to get rusty. 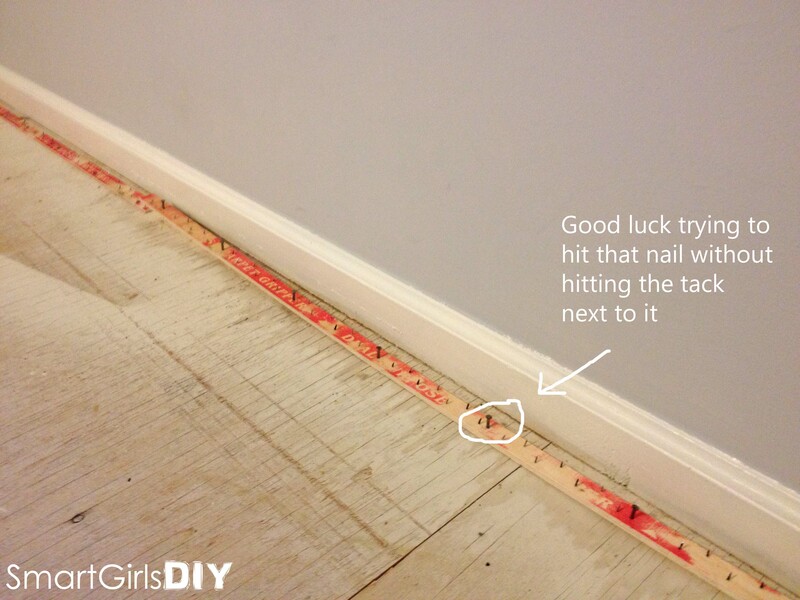 It’s not worth the risk of getting rust on your new carpet, so you should just replace the old tack strips. They are cheap and it’s pretty easy to pry up the old strips and hammer down new ones, so don’t skip this step. Hint: Paint the base molding while the tack strips are out. Replace with new tack strips. Note: It never fails that some of the nails (that come already inserted into the tack strips) are super close to a tack, and while hammering the wood strip to the floor I inadvertently hammer a tack. Don’t worry if this happens to you. There are a lot of tacks, and one isn’t going to break the deal. This is kind of fun because it involves dancing around on the floor listening for squeaks. I found it easiest to dance around until I heard the squeak, then I mark the plywood in that spot with an X (use a Sharpie), and after I found a bunch I came back around and screwed through the X. You want to get the plywood sub floor firmly attached to the floor joists, so the majority of your screws should be in a straight line. I took more pictures of this process when I did my first carpet install. This is easy. Roll out the padding, cut it, and staple it down. If you screw up any of the cuts… it doesn’t matter! You can use scrap pieces to fill in any voids. This is a million times less stressful than cutting and installing the carpet. I used a pneumatic staple gun and air compressor so it went super fast. Just be sure to cover every last little bit of floor. I staple every 2-3 inches around the edges of the pad, add extra staples around the floor vents, and put a few randomly in the middle of the pad. Done. Really you should do this first, but just go with me for a minute. If you want to procrastinate, this is your last chance to buy the carpet you’ll need. And don’t think I’m being crazy… I got all the way to this step before I sent hubby out to buy the carpet. Rolled carpet is HUGE and I didn’t need to store it in my house any longer than necessary. Plus, we live less than a mile from Lowe’s. No joke. Optimize your measurements. 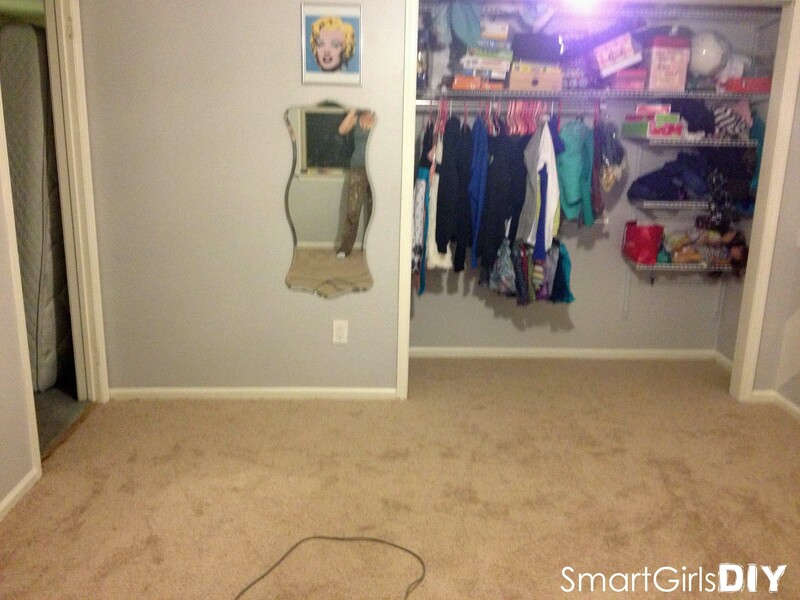 Smart Junior’s bedroom is nearly 12 x 16.5 feet (including her closet). I like to live on the edge, so I bought a carpet that was almost exactly those measurements. It is recommended that you add AT LEAST 6 inches to each side. Especially the cut end (and remember Lowe’s has to cut it on both ends, once for the last person and once for you). In my case, the carpet comes in 12 foot wide rolls, so I knew the 12 foot part would be accurate. Different carpets come in different widths, so make sure you check. Lowe’s automatically gives you an extra linear foot to account for a not-straight cut on their part. So I purchased 17 linear feet and received a 12 x 18 foot piece of carpet. More tips on measuring can be found in that other post I keep telling you about. This means cutting off large pieces that don’t fit the dimensions of the room. Your are NOT trimming the carpet down to the exact measurements. Leave a few inches all the way around, these will be trimmed during installation. On my first carpet install, there was a lot more excess so I cut the carpet down to size on my driveway. This time I laid the carpet out in the room and trimmed off one small rectangle of excess, which is the part next to the closet. The closet side of the room is longer than the side without the closet. Does that make sense? I was excited that I was able to skip the step of cutting in the driveway this time, but it always depends on the room dimensions and the carpet dimensions. Bring the rolled up carpet into the room and unroll it. 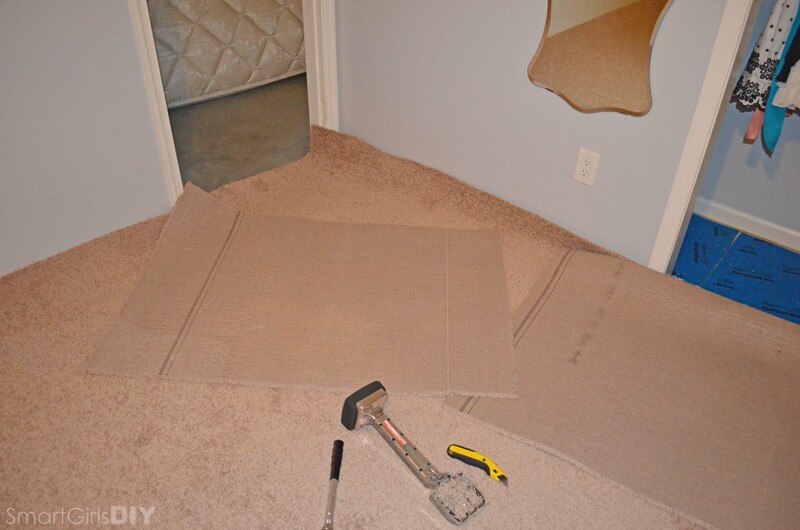 Adjust the giant piece of carpet until it overhangs ALL the walls. I think it’s the perfect time to paint the walls while the carpet is out. 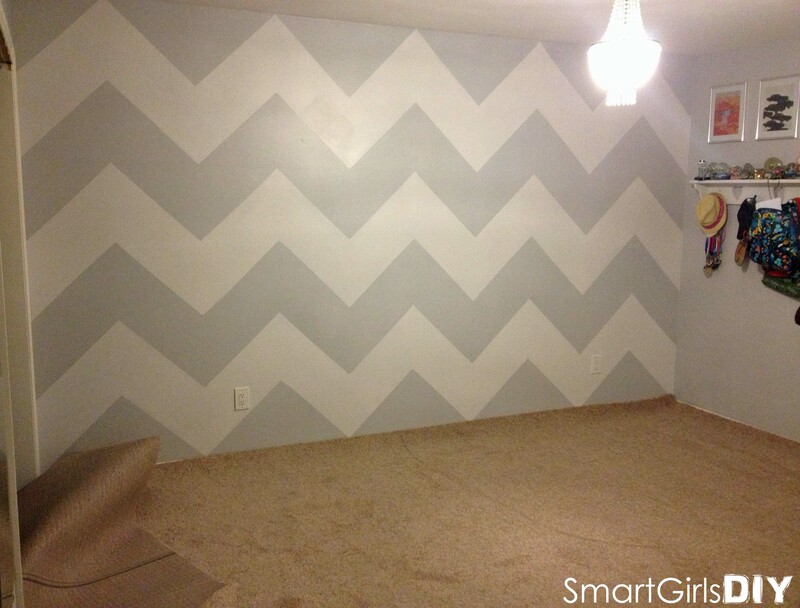 I painted a chevron pattern on one wall before I installed the new carpet. You can read about the evolution of this room here. Using a carpet knee kicker, start in one corner of the room and work your way down the wall. 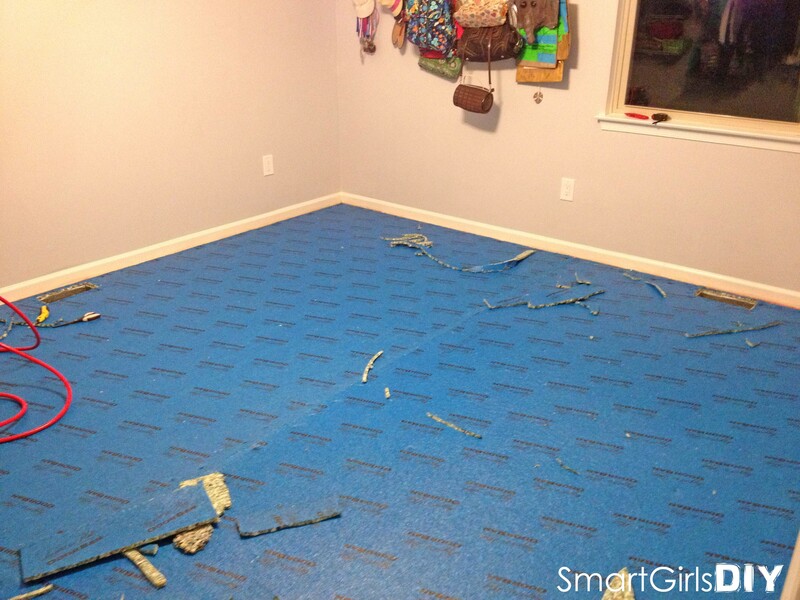 You are going to stretch the carpet over the tackless strips. Lay the contraption, spiky side down, about 3″ from the wall, and forcefully strike the padded end with your knee. There’s no big earth shattering moment here and you’re going to wonder if anything happened. Just keep going. There are a few different ways to cut off the ends, but before you decide how much to cut, tuck the edge of the carpet down between the tack strip and the wall (or most likely the base molding). You should use some sort of a straight edge to really get the carpet in there crisply. There is such a thing as a carpet tucker, but honestly I wasn’t feeling it. Instead I took the blade out of the floor scraper, the one that didn’t work very well as a floor scraper, but it made a great carpet edge poker. 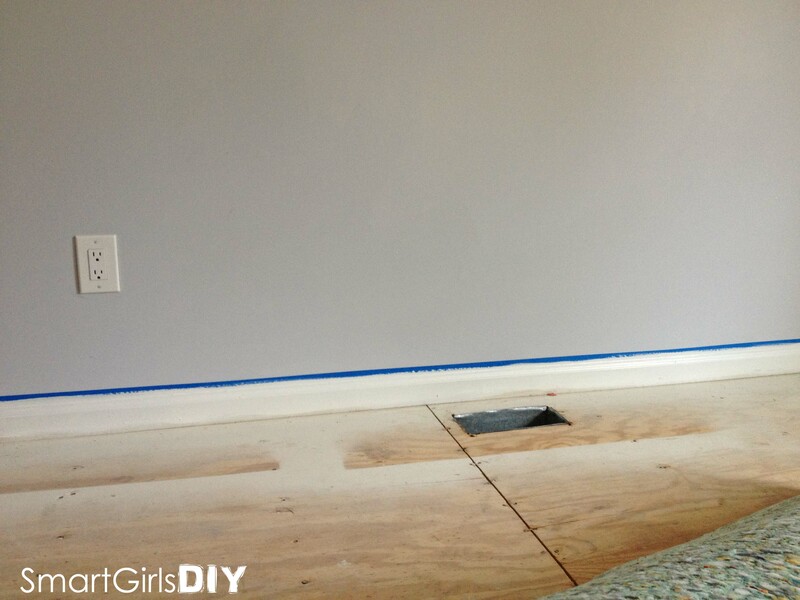 Repeat steps 9 – 11 on each wall, making sure the carpet is stretched out as much as possible. When you get to a door frame, take your time and use a sharp razor blade to cut the carpet to fit around the molding. My brother tells me I am not clear about how much I spend on things, and just saying they are cheap is not good enough, so here’s the breakdown on how much it cost to install carpet in one bedroom. The estimate from Empire Carpet for 4 bedrooms and a hallway was over $9,000. Sheesh! I’ve had people tell me that it would be cheaper to pay Home Depot to install the carpet because the whole house install price is only $37. But… they will not install in-stock carpet, which is so much cheaper. We paid less than $1/square foot. The price also doesn’t include “extras” like installing the carpet pad or moving the furniture. I’ve been looking for a comprehensive guide for carpet installation and it looks like I’ve found it here. I like how you’ve included photos in each installation step. I also like the detailed instructions for tearing out the carpet as well. Thank you Liz for providing the very informative detailed DIY carpet removal and installation project. You’ve done an excellent job with your children’s bedroom! I’m impressed and hopefully this week I’ll be starting in on replacing my old worn bedroom carpet with new carpeting. Thanks for the tip on the “Step Ahead” carpet padding that had hard chunks of sneaker in it. Yikes! I’m inspired now to tackle that project thanks to you. *I’m not brave enough to handle this on my own, so of course I’ll enlist my husband’s help. Take care and many happy DIY’s for you. Thank you Rose for your sweet comment! I really appreciate it!! Is there anyway you can show how to kick the carpet and where to start kicking the carpet? I stuck and all the local installers want a minimum of $150.00 just to come and get things finished up. 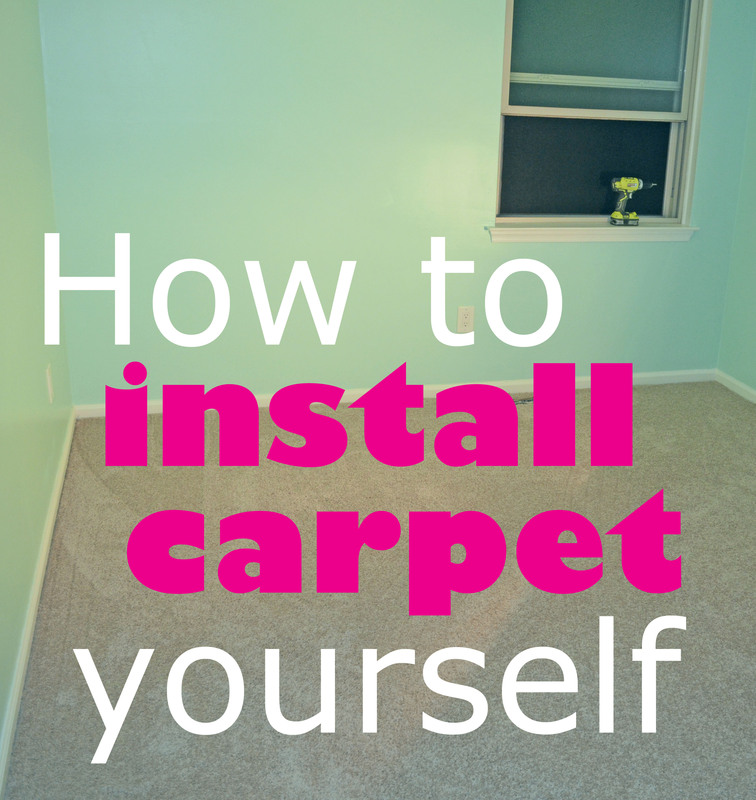 Thank you for sharing such a detailed how to guide for installing carpet! It looks like a professional installed your carpet. Great job! What did you do at the threshold to finish off the edge where the carpet meets the hallway carpet? The hallway is now hardwood flooring. The hardwood runs through the doorway (instead of having a separate threshold piece) and meets the carpet. I thought I was going to have to add carpet tape along that section of carpet, but it has held in place for 3? years now with no issue. I did staple the carpet in two places next to the hardwood, but that is not the proper thing to do. Carpet tape is. Oh well! Yeah so hire a professional and be done.